Just off the parking lot, you'll find an easy or "warm-up" trail for more experienced riders with some tight singletrack. I'd recommend riding this a couple times before attempting the main trail. Once your ready, hop back on the warm up trail and follow it back (to the rear of the gravel lot) and enter. The trail is clearly marked both at the starting point near the parking lot and at the main trail entry. This trail flows great and practicing your skills on this trail will make you a better rider. If you've spent time on the pump track at Ray's MTB Park, those skills will come in handy on this trail. Trail switches back and forth along the valley wall. 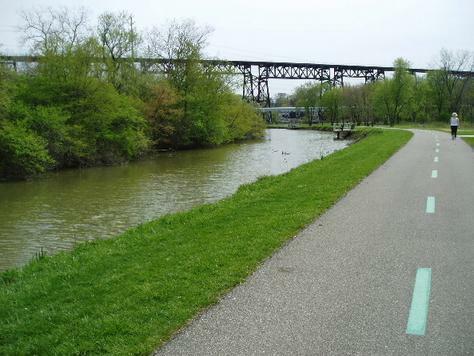 ** This is a CAMBA (Cleveland Area Mountain Bike Association) trail. A: If you are looking at the club house, the trail head is off to the right close to the parking lot. Review: Although the towpath trail is ridden with a lot people riding too slow sometimes and obviously zero rough terrain, there are plenty of exits that make for good mtb exploration. You just have to dig into the park and find them. Also abandoned horse trails are great for mtb. When passing through Boston Mills I suggest that you go up Standford road and take the closed road down to brandy wine. Indigo lake to hale farm is another good exit. Review: I love this trail! It's short and sweet but challenging. Review: Just went out and rode this trail for the first time. I would say im an advanced beginner and I didnt have too much trouble with it. It has a couple spots that will get you if you dont know they are coming and there are a lot of sandy dirt quick turns so it makes it hard to speed through. Overall though an excellent trail that gets easier with every pass and 5-6 passes are easily doable. Review: I'm a beginner, but man was this trail fun and challenging! A lot of great obstacles, climbs, and descents. Not incredibly technical, but still fairly tricky in my opinion. The flow is tough sometimes, but at other times really nice. A few turns are really sandy and wipeout-prone (like I did). I recommend this line, props to CAMBA. Review: BEAUTIFUL trail loop, the only down fall is that it needs more miles of trails. Review: Trail was fast and flowy just too short. Ended up riding the singletrack twice and turned out more miles on the paved trail. Good scenery. Lots of stuff to take pics of. Review: I ride this weekly and enjoy the fast 2 mile loop. Review: This is a well maintained trail. Ohio And Erie Canal MTB Trail 4.13 out of 5 based on 8 ratings. 8 user reviews.